The Windsor Spitfires were on the road tonight and came up short against the Saginaw Spirit losing 5-2. The Spirit now lead the series 2-1. During the first period Saginaw was able to take advantage of the home ice and rally to score three goals: one by Shalla and two by Ross. 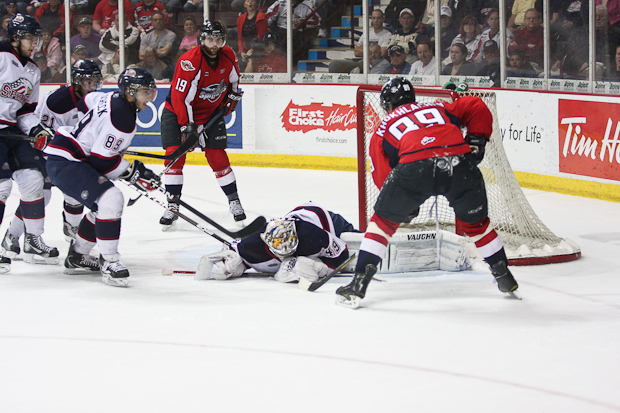 Windsor’s Zack Kassian was able to score during the second period but Saginaw’s Trocheck also added a goal and the Spirit sat comfortably with a 3 goal lead going into the third and final period. Despite this three goal deficit the Spits were still able to keep up the pressure and were matching the Spirit in shots. Their netminder Mavric Parks was hot in net tonight. During the third period the Spitfire’s Khokhlachev scored unassisted halfway through the period to cut Saginaw’s lead to 4-2 before Saginaw scored again giving them a 5-3 lead off the powerplay. Game 4 will be Thursday night at the WFCU Center in Windsor.